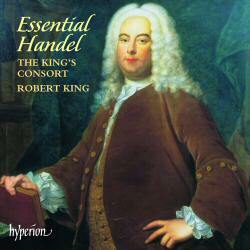 This is not really the essential Handel. But it can only be a good thing that those who only want the so-called ‘Largo’ and bits of Messiah will be mystified by this. However, it is extraordinary that there is not a single item representing any of Handel’s operas. Despite the disc being a nicely packaged introduction to Hyperion’s series of Handel discs by the King’s Consort, this would still allow for any of the arias from their recording of Ottone (Claron McFadden’s ‘Falsa imagine’ is among the most effective I’ve ever heard), or room could have been found for an aria or two from the fine recital disc with James Bowman (perhaps ‘Or la tromba’ from Rinaldo or ‘Se parla nel mio cor’ from Giustino would have been more useful here than some of the less overwhelming selections from oratorios). Nor is Handel’s brilliant period in Italy represented at all. Yet even if some of Robert King’s memorable Handel recordings are seemingly forgotten (neither his lovely Acis & Galatea and the Italian duets disc featuring Gillian Fisher and James Bowman find any room here), this is a timely reminder of how Hyperion and the King’s Consort have significantly enriched the Handel discography. The emphasis of this collection is very heavily upon Handel’s later English oratorios and odes. If this overlooks the drama and intensity one finds in his operas, it is compensated for in the richness of gorgeous inventions such as Robin Blaze’s poignant ‘Yet can I hear the dulcet lay’ (The Choice of Hercules), the choir’s magnificent conclusion to ‘Or let the merry bells ring round’ (L’Allegro, ll Penseroso ed il Moderato) and Lynne Dawson’s beautiful ‘Hark! Hark! He strikes the golden lyre’ (Alexander Balus), featuring Handel’s rare exotic use of mandolin and harp. It conjures a mixture of textures that places Handel closer to Vivaldi than one expects in an English oratorio from late in Handel’s career. I can imagine a few innocent casual buyers of this disc being astonished and delighted by the selections that show Handel’s gift for sublime poetic expression. I am troubled by Hyperion’s insistent presentation of the so-called ‘Un puro ardor’ from the 1736 cantata Cecilia, volgi un sguardo as if it is an aria in its own right. It is only a B section: robbed of the A section that should precede and follow it the music becomes merely a disembodied moment of beauty without its glorious context (it seems churlish to complain too much when Carolyn Sampson sings it so exquisitely, but I do not think that encouraging people to think that B sections are isolated compositions ought to become a habit). However, avid Handel collectors will also find this compilation very enjoyable: even if you have all of Robert King’s Handel recordings issued by Hyperion, this sampler also includes two pieces that have not been commercially released before. The melancholic Largo from Opus 3 No. 2, sensitively played by the King’s Consort (although ending an extract on the dominant key makes for uncomfortable listening if you are the sort of person who wants to hear a concluding fast movement in the tonic key). Lorna Anderson and Crispian Steele-Perkins give their all in a performance of ‘Let the bright seraphim’ that was previously distributed to the King’s Consort sponsors on a private recording. There have been few champions of the less popular militaristic English oratorios Handel composed during the second half of the 1740s. Robert King has done more than most to unearth the treasures in Joshua, Judas Maccabaeus and The Occasional Oratorio. Extracts from these will certainly please those who buy this disc in order to have ‘Zadok the Priest’ and a few bits of the ‘Water Music’ and the Music for the Royal Fireworks. Indeed, this compilation will be warmly received by those who resolutely regard Handel as a British icon rather than as the disclipe of Alessandro Scarlatti, Corelli and Keiser. The overall programme is not perfect, nor is each individual performance strictly essential, but Robert King rarely lets Handel down. This is not ‘The Only Handel Album You’ll Ever Need’ (thank goodness Hyperion have not gone down that disgusting marketing path unlike some of their more corporate competitors), but it is enjoyable for both hardened Handelians and the curious beginner alike. Hopefully it will earn Handel some new admirers.